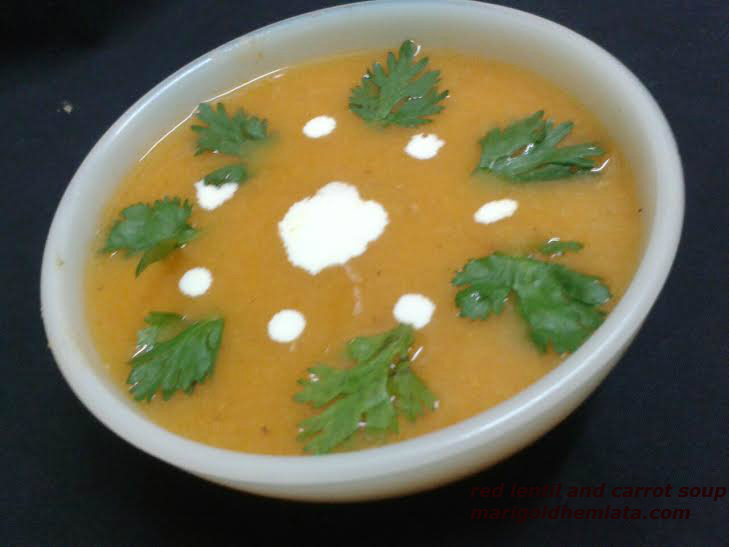 Soup is primarily liquid food, Serve warm or some time served chilled. Made by combing ingredients of vegetables, meat, chicken or lentils and water or liquid. प्रेसर कुकर में मक्खन को गरम करें और इसमें भीगी हुई दाल, गाजर, प्याज़, लहसुन, काली मिर्च पाउडर, अदरक, दालचीनी, लौंग, टमाटर और लहसुन को डालकर चढ़ा दें. ढक्क्न लगाकर २-३ सीटी आने दें. अब गैस बंद करें और मिश्रण को ठंडा कर लें, मिक्सी में मिक्सचर को स्मूथ हो जाने तक चला लें. अब मिश्रण को फिर से कुकर किसी और बरतन में चढ़ा दें. एक उबाल आने दें, नीबू का रस मिलाएं, २-३ मिनट उबाल कर गैस बंद कर दें. Heat the butter in pressure cooker, add lentil, carrot, garlic, onion, ginger, black pepper, salt, cinnamon, cloves and tomatoes. Cover and cook under pressure till 2-3 whistles are given out. Transfer the mixture back into the pressure cooker you can use another pan too. Bring it to a boil, add lemon juice mix well. boil for 2 -3 minutes more. 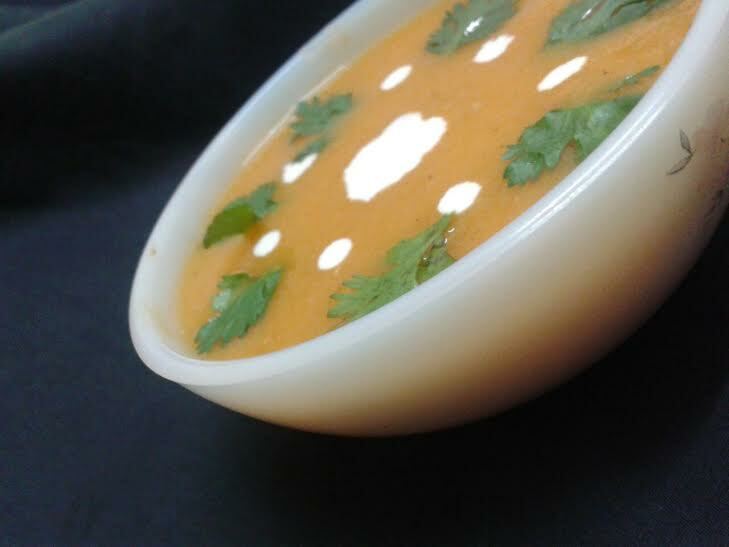 Pour into serving bowl, garnish with coriander leaves and fresh cream.